Stomach pains that last for three days after eating shrimp are probably caused by food poisoning. Shellfish can carry infectious organisms that can cause temporary digestive complications. The most common bacteria found in shrimp that causes food poisoning is V. cholerae. If you suspect that you have food poisoning, call your doctor for further evaluation. 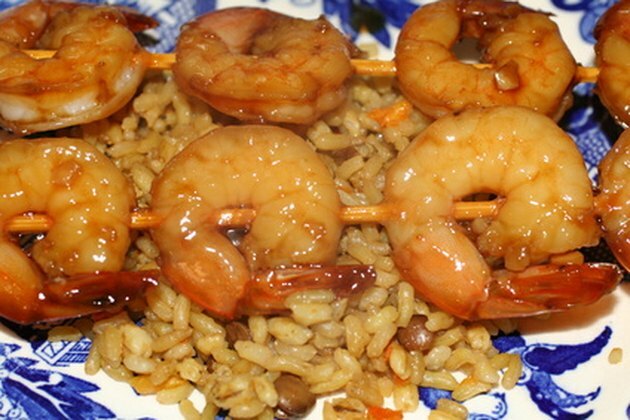 Shrimp that are infected with bacteria, parasites, toxins or viruses will cause food poisoning. Your digestive system becomes inflamed for one to 10 days, leading to digestive symptoms. These symptoms include stomach pain, cramping, bloating, gas, vomiting, diarrhea, nausea and a low-grade fever. Most initial symptoms develop within the first four hours after you've ingested shrimp, but can develop up to 36 hours after consumption. Shrimp that is contaminated with infectious bacteria may not have been cleaned properly, may have become infected by cross-contamination or may have been left out at room temperature for too long. During the food-handling process, dirty hands, dirty utensils or contaminated surfaces can contaminate shrimp. Food poisoning is treated with increased fluids, diet modification and rest. If your doctor confirms that you have food poisoning, start drinking plenty of fluids to prevent dehydration due to vomiting and diarrhea. You may need to eat a bland diet that promotes bulk-forming stools, such as white rice, white toast, plain yogurt, bananas and apples. If your symptoms improve, you can add other bland foods, such as crackers, boiled potatoes, cooked carrots, skinless chicken and fish. Talk with your doctor about what you should eat. You are at greater risk of getting food poisoning if you eat shrimp that is raw or that is kept on a buffet line. Food poisoning typically resolves itself on its own. People who are greater risk of food poisoning or a severe reaction to food poisoning are the elderly; infants; people who have a pre-existing medical condition; people taking antibiotics, antihistamines or steroids; people with a compromised immune system and pregnant women. Such patients should call their doctors immediately if they suspect food poisoning.